Medicaid reimbursement provides a pathway for eligible individuals and families to obtain behavioral health services. When supplemented with state and philanthropic funds, Medicaid offers resources that contribute to the sustainability of non-profit community-based organizations (CBOs) whose mission is to serve people with low incomes. This report summarizes the “lessons learned” about the Texas Medicaid program and the strategies for obtaining Medicaid reimbursement for Medicaid enrollees as well as sustaining the delivery of behavioral health services. Learn more about this Community Report here. Despite the growing interest in the experiences of foster youth, relatively little is known about how foster youth differ from other at-risk youth who have no history of foster care involvement. The goal of the current report is to address this gap in the literature, by providing an in-depth look at how transition-age foster youth compare to other at-risk youth of a similar age across a wide variety of characteristics. 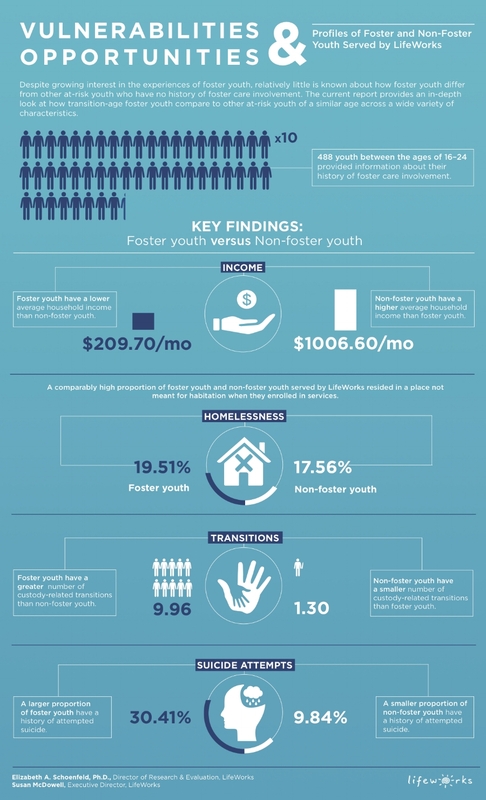 Read our white paper on profiles of foster and non-foster youth served by LifeWorks here.